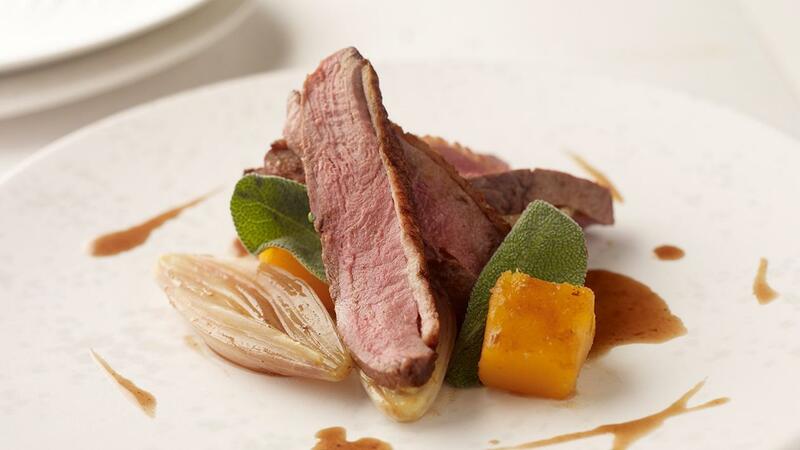 Surprise your guests with this fruity version of duck breast with butternut squash and orange star anise sauce. It is fast to prepare and most importantly, it is a tasty option for your gluten free customers. Place the duck breasts skin side down on a cold heavy frying pan. Cook on a high heat for about five min. or until the skin is crisp. Turn the breasts over and reduce the heat. Cook for further three to five min. for pink meat. Cook longer for medium or well done meat. Place the butternut squash, shallots and bacon in a bowl and add the orange and lime juice, olive oil, honey, butter, sage and thyme. Toss all the ingredients together and spread on a roasting tray. Bake in a preheated oven at 180ºC for about 15 to 20 min. or until tender. Heat the sugar and vinegar until it caramelises, forming a brown caramel. Add the orange juice, star anise and KNORR Gravy Paste and simmer for five min. Strain and add the orange zest. Allow the duck breasts to rest. Spoon the squash onto serving plates, place the duck on top with the rocket leaves and drizzle with olive oil. Garnish with star anise sauce.